This Easy Apple Cobbler is fantastic and super simple, thanks to a package of flapjack and waffle mix! 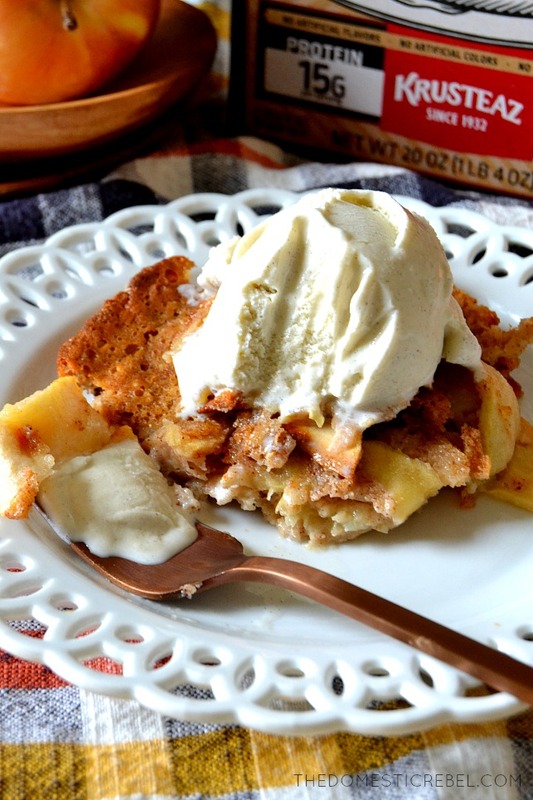 You’ll never go back to regular apple cobbler again. This time of year is my all-time favorite! For one, I no longer have the stress of being “bikini-body ready” because this time of year ensures I’m always poncho-ready, thanks to the copious amounts of fall baking I do. Second, I love fall flavors so much! There’s something so comforting and warming about apples, pumpkin, pecans, pies, and cobblers. I know cobblers and pies can be year-round, but let’s face it: fall baking dominates the pie world as we know it. Around this time of year, my family and I head to Apple Hill. Situated in Gold Country, it’s a series of orchards nestled in rolling hills amidst vineyards, trees, and lots of fresh mountain air. The orchards have lots of things for the whole family: pumpkin and apple-picking, hayrides, haunted houses, craft booths, and of course: FOOD! Every year that we go, my family and I stock up on their famous pies, caramel apples, and their life-changing apple doughnuts, hot from the fryer. I also make sure to bring home a bushel of their freshly picked apples because they’re always so perfect, juicy, and sweet, and they have a lot of varieties I can’t find at my grocery store. As you can imagine, while I do eat a lot of the apples by themselves, I mostly bake with them! I realized I don’t have an apple cobbler recipe on my blog, and that had to change immediately. 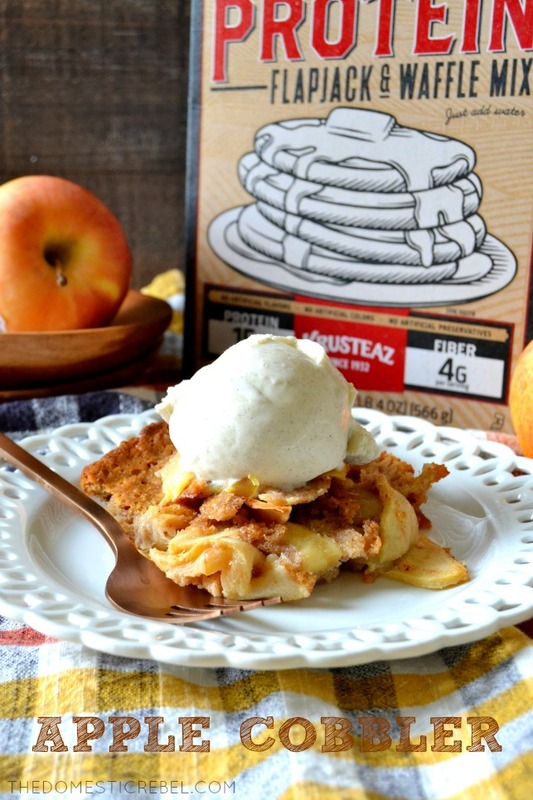 This year, I’m yet again a brand ambassador for Krusteaz, so when Krusteaz asked me to create a recipe using their new Buttermilk Protein Flapjack and Waffle Mix, I knew I could make cobbler out of the base! The cool thing about this Buttermilk Protein Flapjack Mix is that it is loaded with whole wheat and extra protein, so it makes this cobbler a little heartier. You basically mix together a cup of the Buttermilk Protein Flapjack Mix with some other simple pantry staples: milk, an egg, melted butter and sugar, and throw in some spices like cinnamon and nutmeg for good measure. Pour the mixture into your pan and top with a heaping mound of freshly sliced, peeled apples: almost any kind will work, so use what’s in your crisper. The cobbler bakes for almost an hour so it gets nice and golden brown but still has a soft and gooey interior, and the apples get tender but still have a juicy bite. The only other thing it needs is a gigantic scoop of vanilla ice cream. How can you not?! This Easy Apple Cobbler is super simple, comes together quickly, and is a great way to use up your farmer's market bounty of apples! Preheat oven to 350 degrees F. Liberally grease an 8x8" cake pan. Set aside. In a large bowl, combine the flapjack mix, egg, melted butter, milk, sugar, and spices with a whisk until smooth. Batter will be thin. Pour the batter into the prepared pan. Meanwhile, in a medium bowl, toss together the sliced apples and the brown sugar until coated. Sprinkle the apple and sugar mixture evenly over the top of the batter in the pan. Bake for 50-60 minutes or until the cobbler is golden brown and set. Cool for about 15-20 minutes before serving. Serve with vanilla ice cream. Super easy, comforting, and perfect for cozy fall nights! Be sure to follow Krusteaz on their website, Facebook, Instagram, Twitter, and Pinterest for more recipes, tips & tricks, and more! Disclaimer: I am a brand ambassador for Krusteaz and this post is sponsored; however, all opinions are 100% my own. I was compensated for this post. Thanks for supporting the brands that keep my blog alive! Fall flavors really are the best. I can’t wait to try this easy recipe! This looks amazing! I love that it’s made with a high protein, whole wheat mix for a healthier option too. Yum! Yes! I hope you love it! What a FUN way to use flapjack and waffle mix!! I adore anything Apple and tis the season, I know what I’m making this weekend! Thank you Alli! It is such a lovely way to use their flapjack mix! 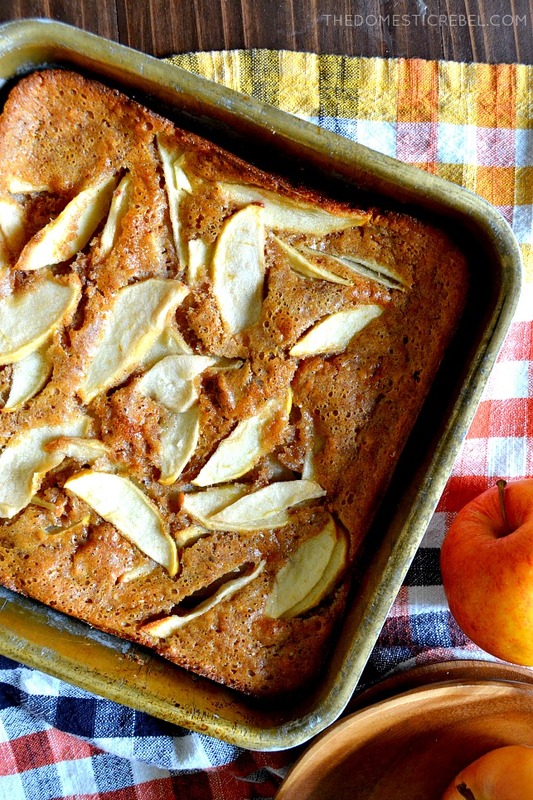 Ahhh this cobbler is GORGEOUS and I bet it makes the house smell amazinggg as it bakes! 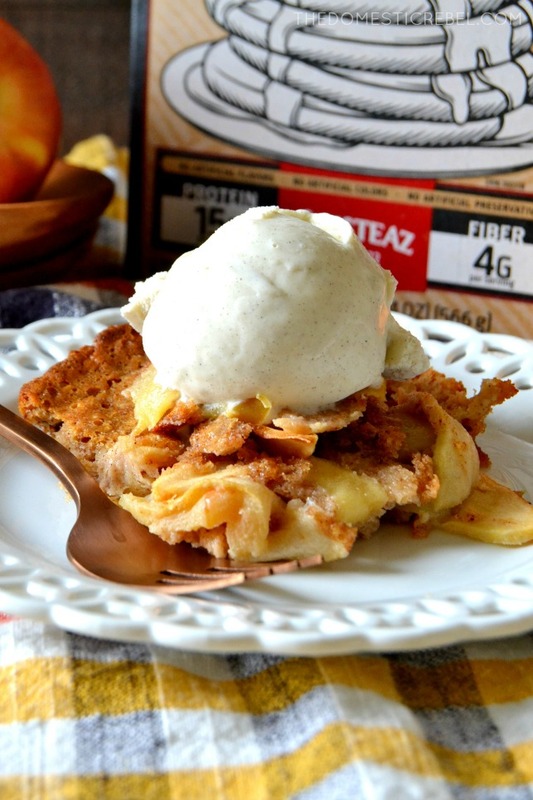 I love that you can make Apple Cobbler with flapjack and waffle mix! Cannot wait to try it this weekend! Looks delicious! Can’t wait to give it a try! Looks easy and yummy. Serious comfort food for this fall. They are! Love their products!